What an interesting bird and curious at best! 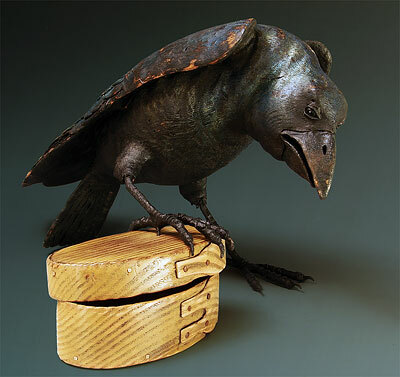 This raven is beautifully hand carved from American chestnut and Peter captured the curiousity on its face as it gently removes the lid from the shaker box to see whats inside! There are several visible worm holes in this carving and the wood grain is just wonderful. The raven's feet are hand made by the artist from copper wire and epoxy, truly life-like. This carving looks great on any table but can also be displayed on mantels, armoires or chimney cupboards. Rare and unique!